There are many ways to improve the gameplay experience while ensuring a better grip, accuracy and comfort. The range of accessories are seemingly endless and can range from smaller product such as controller and thumb grips to larger products such as racing wheels. 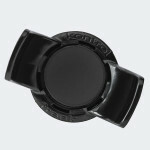 The latter one is often difficult to store but KontrolFreek offers a similar product that is much smaller in size. We’ve taken the KontrolFreek SpeedFreek Apex, which is designed specifically for racing games, for several test spins – pun intended. 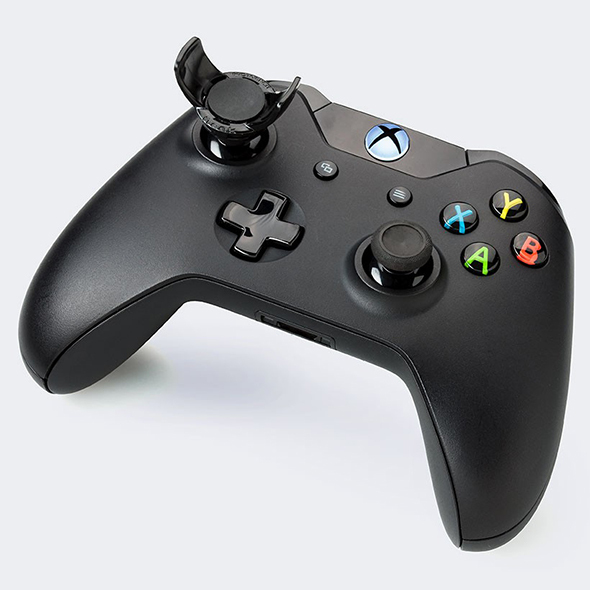 The SpeedFreek Apex is an improved version of the original SpeedFreek and comes in the standard black color. This seems rather simple and unadventurous seeing as the other thumb grips in KontrolFreek’s range come in a variety of colors. However the SpeedFreek Apex isn’t designed to make your controller look unique. While it would have been a nice touch to offer the racing grip in several monotonous colors to fit any secondary grip you’ve added on your controller, it’s not entirely necessary since the black color scheme fits any type of color. When it comes to the design, the SpeedFreek Apex features an odd shape that is somewhat hideous compared to the other thumb grips in KontrolFreek’s range. The thumb grip is comprised of two parts, unlike the original SpeedFreek which was one part only, and needs to click together before installing the grip. This was rather easy to do but you cannot take it apart again. The middle area where the thumb will be resting on is comprised of a smooth rubber-like foam. The smoothness makes it easy to slide to the sides which can be compared to skateboard ramps. These so-called ramps are the most important part of the design as they provide more accuracy than an original stick does. We cannot truly compare the ornaments with previously tested thumb grips since there are none. Installing the thumb grip was much easier than the FPS Freek CQC Signature and the Freek Galaxy and the accessory didn’t chafe the original stick. Removing the SpeedFreek Apex from your controller proved more challenging than installing it, especially if you don’t want to ruin the controller in any way. The racing thumb grip isn’t going anywhere once installed as the three clips latches tightly onto the original stick. A huge difference from the original SpeedFreek is that you can twirl the U-shaped attachment thanks to the two-part design, upping the comfort levels even more. While steering wheels such as the Thrustmaster T150 Force Feedback provide a certain realism to the experience and feel far more superior, the bulky and often expensive combination of wheel and pedals can be a hassle to store. 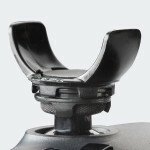 The height of the ramps on the SpeedFreek Apex can significantly increase the height of your controller but the difficulty in storing is incomparable. As the SpeedFreek Apex is designed specifically for racing games, we’ve tested it extensively in Forza Motorsport 6 on a large variation of tracks with various weather conditions. Surprisingly this simple yet odd-shaped thumb grip excels in what it is supposed to do. The design allows the player to make more precise movements on the track without their thumb slipping off during those tricky turns and the soft foam increases the comfort levels during extensive gameplay sessions. As minor this addition is, it will give the player the ability to feather the steering and thus it allows the player to improve their lap times. Unlike the previous models we’ve tested, the SpeedFreek Apex isn’t great for other types of games other than racing games. Of course, some players might still find the U-shaped design interesting for first person shooters but this is more a matter of personal opinions. 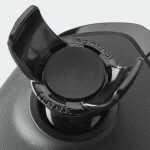 The KontrolFreek SpeedFreek Apex offers a more fluid and natural racing experience than the original thumb sticks and while it is certainly not as realistic as the bulky and expensive steering wheels, the accuracy comes rather close. In fact, handling your car during any kind of weather condition without adjusting changing your car’s set-up has never been this easy with controllers. 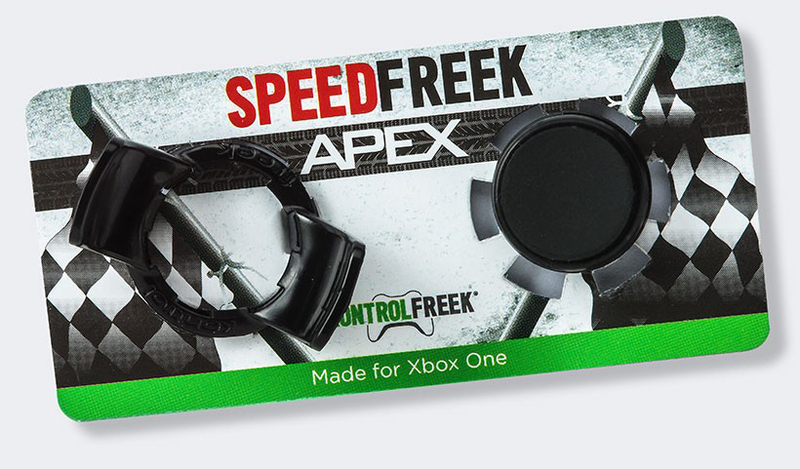 We can highly recommend the SpeedFreek Apex for those that are seeking to improve their spot on the leaderboards.